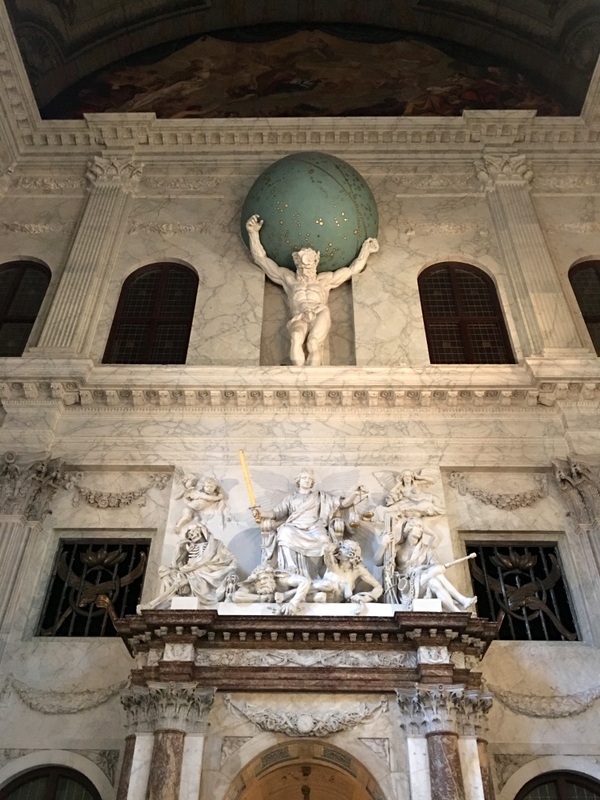 During my recent stay in the Netherlands I have visited an unusually large number of museums…:-). I have reported already about the two patrician canal mansions and the Royal Palace. Here are four more, in chronological order. During the usual visit to my sister, she suggested that we could visit the Kranenburgh Museum in Bergen. Bergen is a village in the province of North-Holland, in the first part of the 20th century it was an “artist colony”.The expressionist Bergen School of painting had its origin here and the museum contains many works of art from that period. But that’s not why we went there. 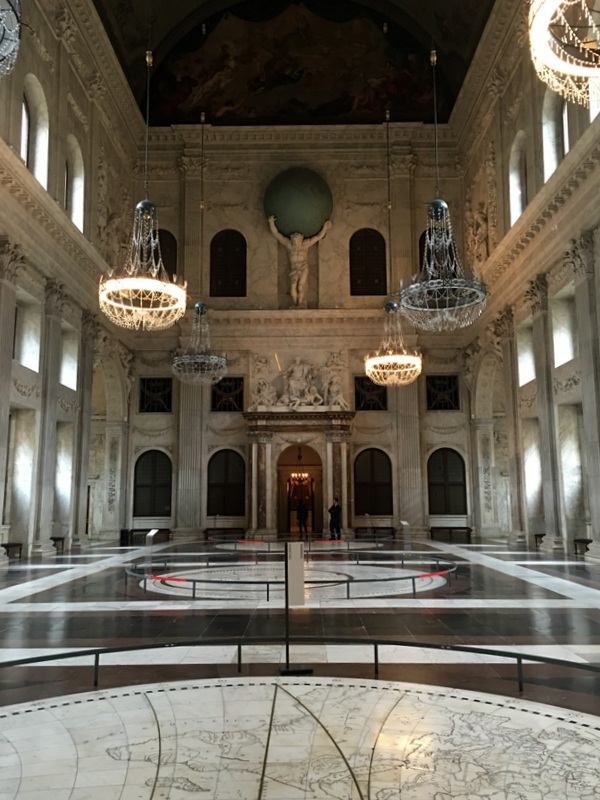 In December 2015 a special exhibition was opened, prepared by guest curator Joost Zwagerman, and titled “Silence out loud” Various aspects of silence in art. I found the exhibition very impressive, really evoking silence. Joost Zwagerman, a Dutch writer and columnist has been working two years on this project. 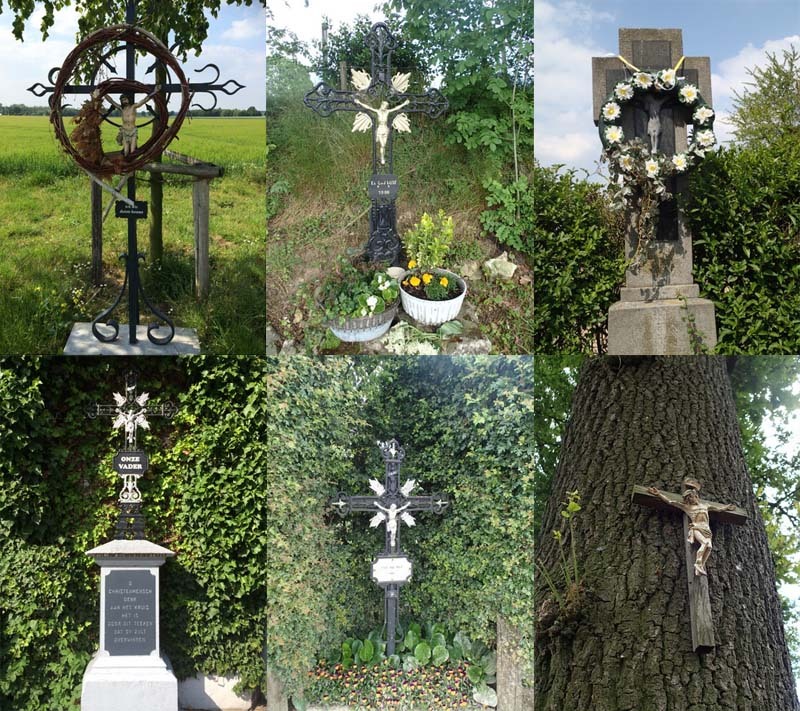 And he has not seen the final result, because he took his own life, a few months before the opening of the exhibition. Sad. A few days later I visited an exhibition about Ernst Ludwig Kirchner in the Singer museum in Laren. Laren is another Dutch art colony and the Singer museum has many works of art from the “Haagse School“. Kirchner was a German expressionist painter and one of the founders of the artist group Die Brücke. I like his work, it is always a pleasure to come across his paintings in a museum and in this exhibition they had collected many of his works of art. Born in 1880, he volunteered for military service in 1914, but was discharged soon after a mental breakdown. Having health problems, he moved to Davos in Switzerland and stayed there the rest of his life. One of his friends there was the Dutch painter Jan Wiegers, one of the founders of the artist collective De Ploeg. See below…:-). 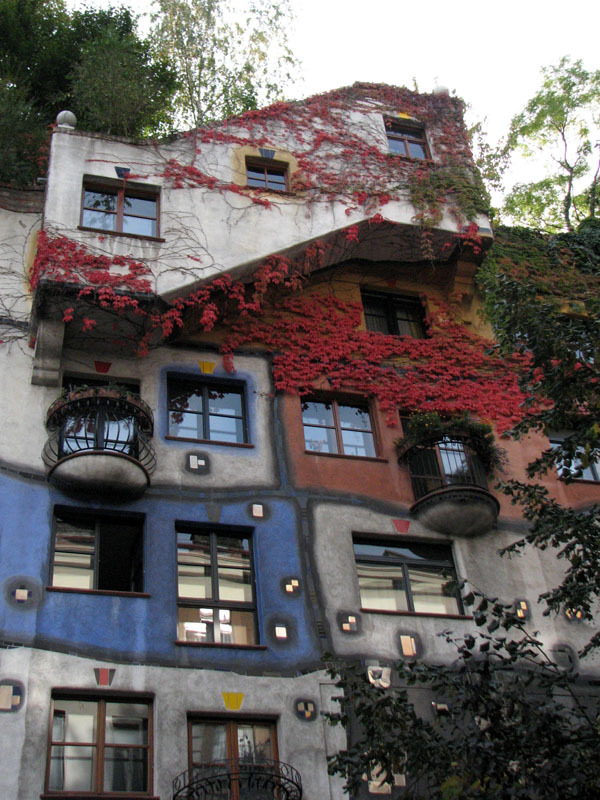 With the rise of Nazism his art was considered “entartet” (degenerate) and many of his paintings were destroyed. Worried that Hitler might invade Switzerland, he killed himself in 1938. My next museum visit was to the Groninger museum. Here in December 2015 an exhibition opened about David Bowie. I am a fan of this fascinating artist. When his album Ziggie Stardust was published in 1972, I was beginning to discover the “alternative” pop music. I would have liked to see this exhibition, but it was planned to close early March, before I came back to the Netherlands. 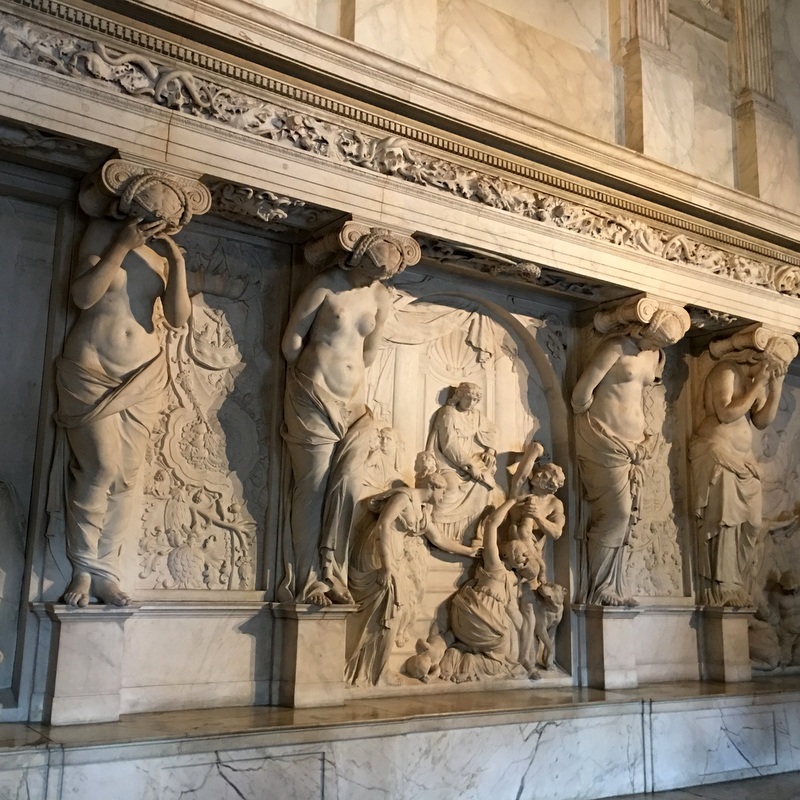 My time slot started at 4pm, I arrived early, so I decided in the meantime to have a look at the permanent collection of…. De Ploeg, mentioned above…;-)! That was a good idea. Interesting to compare the two expressionist schools, their differences and similarities. In Laren one painting by Jan Wiegers, here two paintings by Kirchner. Another painting at the back! The last museum visit was actually rather accidental…:-). I was going to meet after many years a former colleague from my school, and she suggested that we could have coffee in the museum cafe of the Allard Pierson museum in the center of Amsterdam. 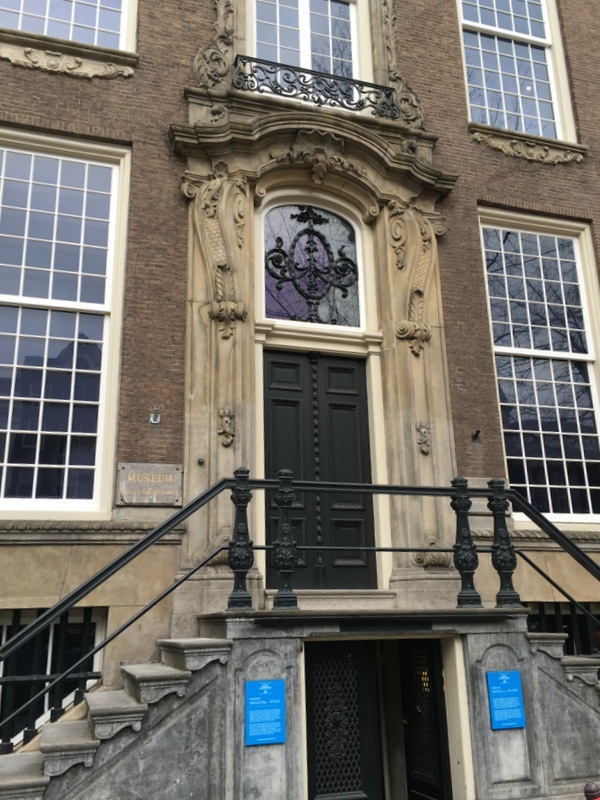 This is the archaeological museum of the University of Amsterdam. But when we were there, we noticed that there was a temporary exhibition, called the DWDD Pop-Up Museum 2. DWDD is a popular Dutch television talkshow, which I avoid to watch because I am allergic to the ADHD host…:-). He has quite a few regular guests in his show and the Pop-Up Museum is a project where these guests are asked to select a museum of their choice, visit the depot (where usually most of a museum collection is kept) , choose some works of art and create a room for the exhibition. Actually an interesting idea. The first edition of this project was a success, this is the second one, open until 22 May 2016.There are nine rooms, here a selection. In the captions you see the name of the guest and the museum they have selected. 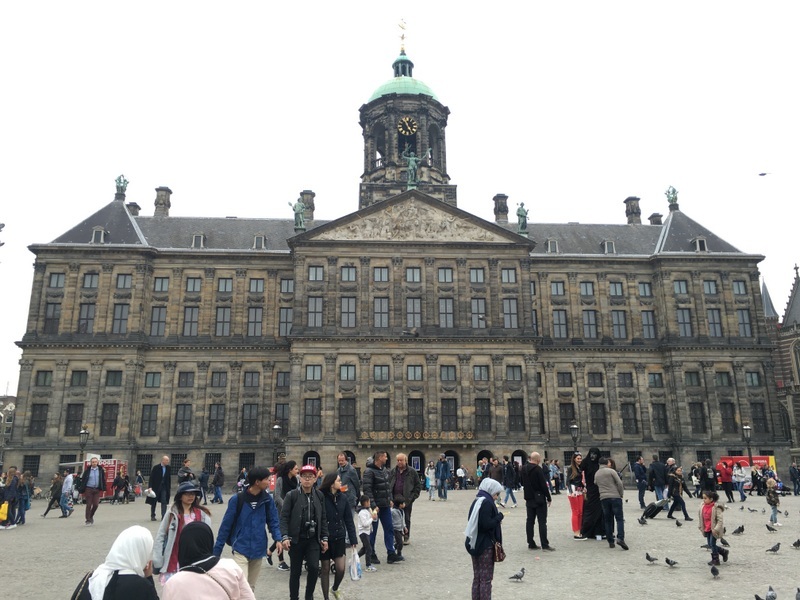 The Dam Square in Amsterdam can be considered the center of the town. It is dominated by the Royal Palace. Here is a Google Earth image. This monumental building has not always been a palace. 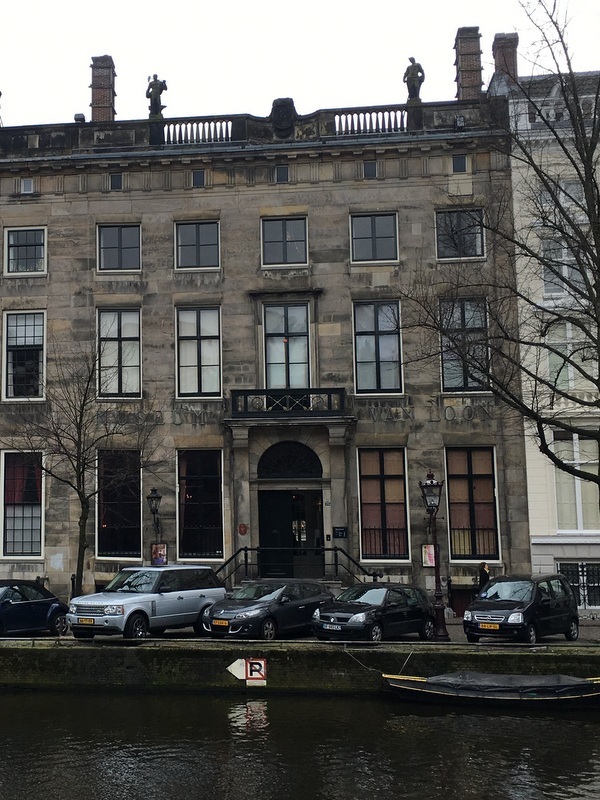 It was built in the seventeenth century as the Town Hall of Amsterdam and functioned as such for 150 years. For a long time it was the largest administrative building in Europe and considered by many the Eight Wonder of the World. In 1808 Louis Napoleon, brother of the French Emperor Napoleon Bonaparte, became King of Holland and converted the Town Hall into a Palace. 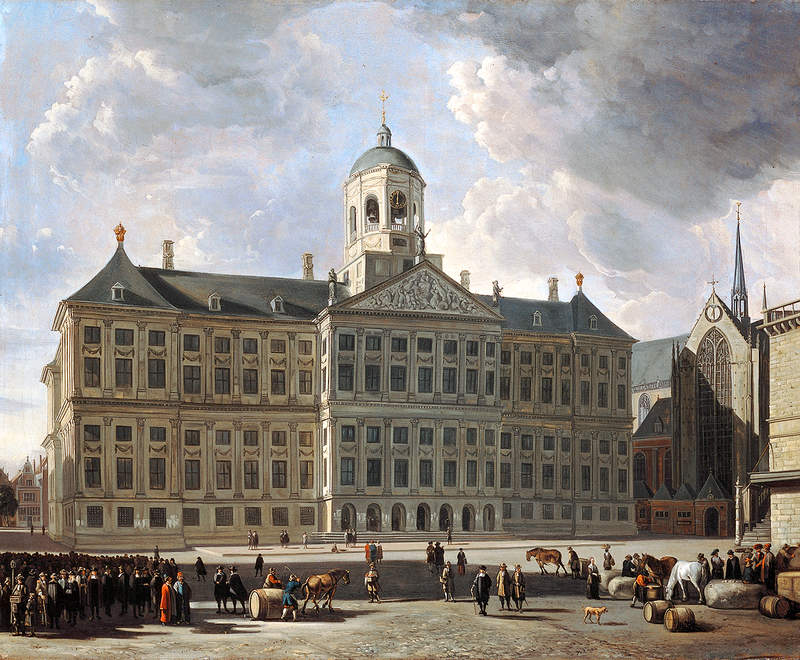 Not for long, in 1813, after the fall of Napoleon, the Kingdom of the Netherlands was established and the former town hall became a Palace of the Royal House of Orange. Nowadays it is a ceremonial palace, still in use for the inauguration of a new monarch and other official functions. Left a painting of the Town Hall as it was in 1673, right the present situation. When not in use, part of the palace is open to the public. Here is a map of the main floor. 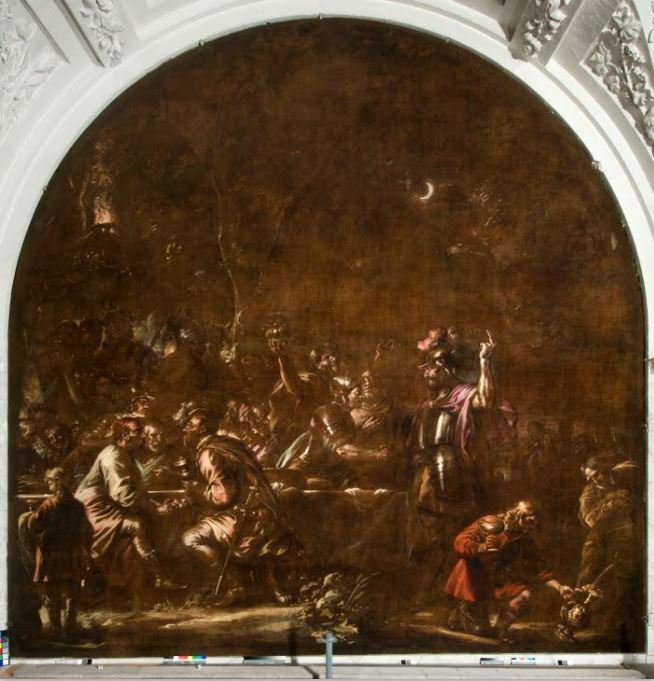 It is not easy to see details of the paintings, because they are very high up the walls. 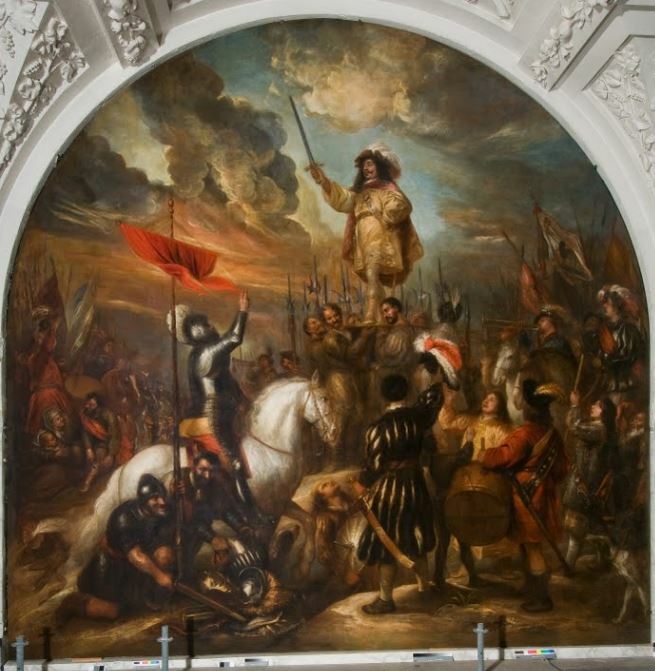 Many of them show historical scenes, related to the fight for independence of the Dutch Republic. 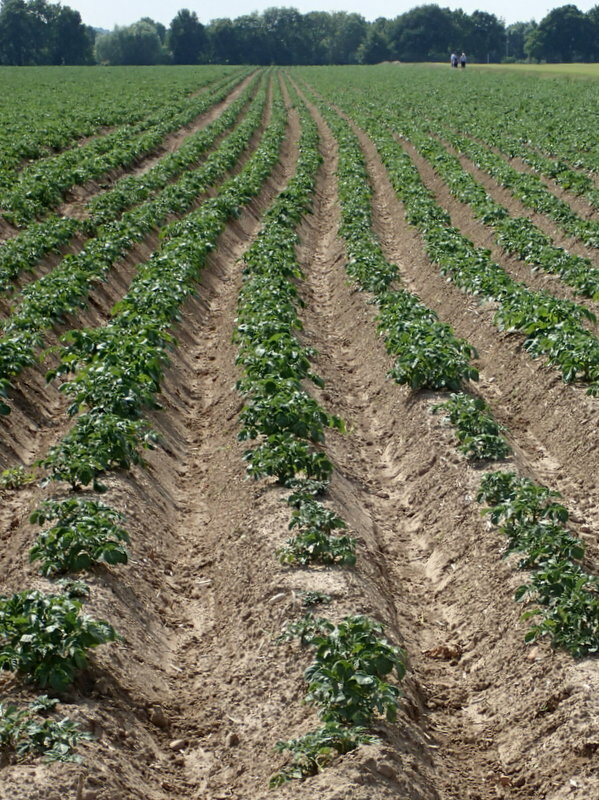 Here are two images, taken from the Internet. 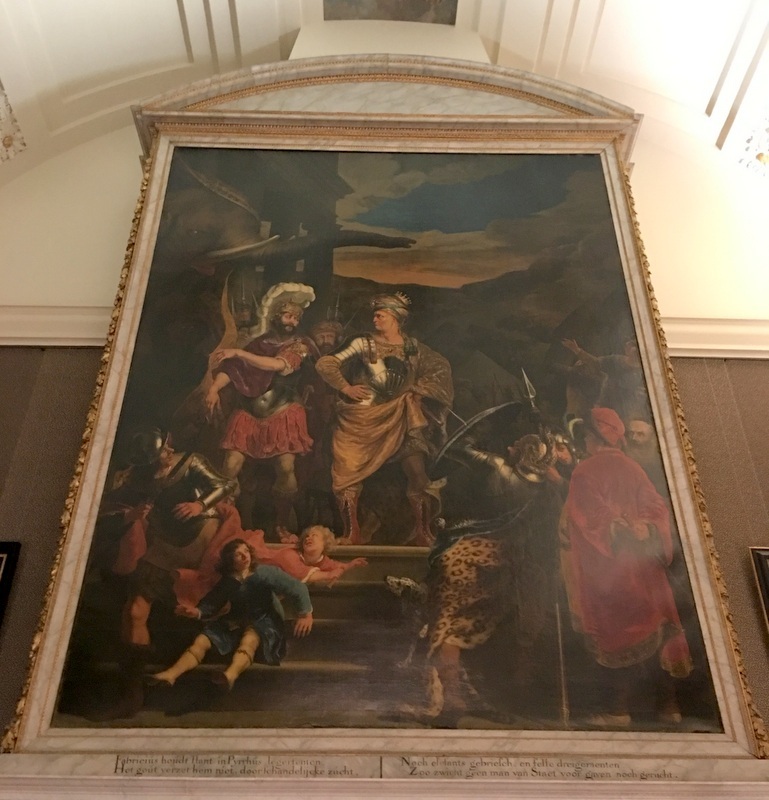 Left The Conspiracy of the Batavians under Claudius Civilis (1559-1562) by Govert Flinck and right Brinio Raised on a Shield (1661) by Jan Lievens. Click on the link and then on “details” for more information about these paintings. Here are two more paintings. 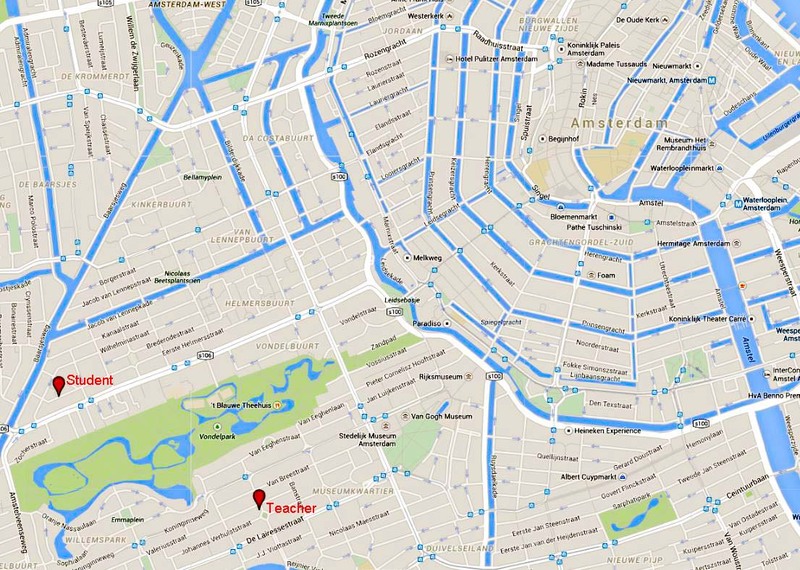 Amsterdam, the leading city of the Dutch Republic, saw itself as the successor to the Roman Republic. Its “burgomasters” (mayors) liked to identify themselves with the Roman consuls. Left, Fabritius and Pyrrhus (1656) by Ferdinand Bol, shows the consul Fabritius resisting the bribery attempts of King Pyrrhus. 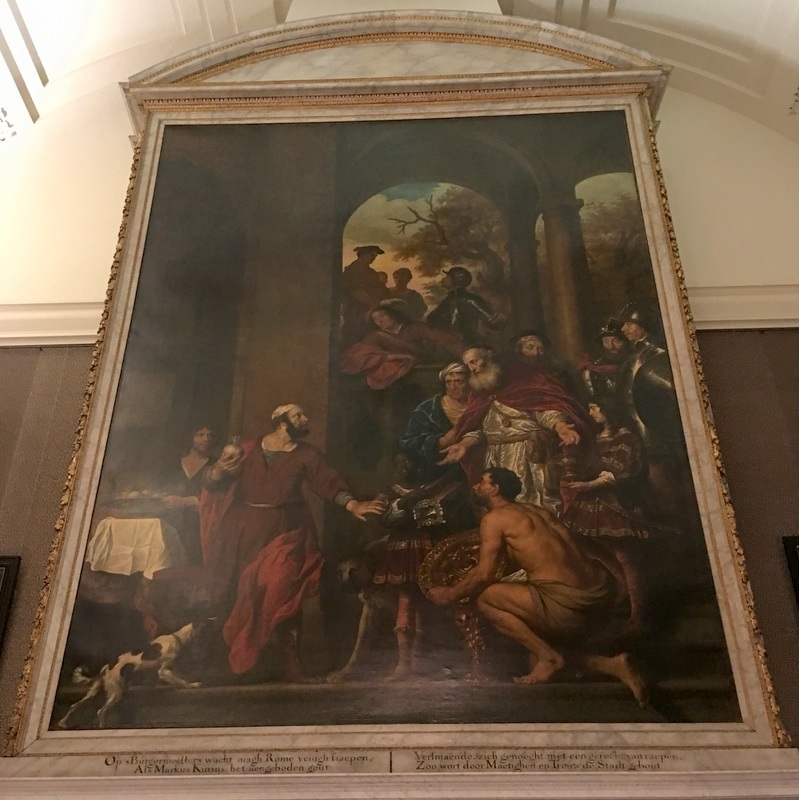 Right, in The incorruptible Consul Marcus Curius Dentatus (1656) by Govert Flinck, the consul holds up a turnip, waving away the gold and other gifts, offered to bribe him. Again: click on the links and then on “details” for more info. 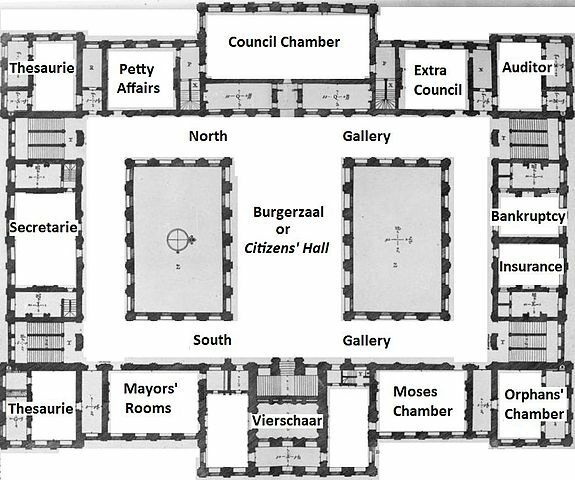 On the map above, the original function of the various rooms is indicated. When the town hall was transformed into a palace, these rooms became bedrooms, dining rooms, ballrooms etc. They were furnished in Empire style. Even now some of the rooms are used as guestrooms for heads of state and other VVIP persons during official functions. The admission price for the Palace includes a headset. 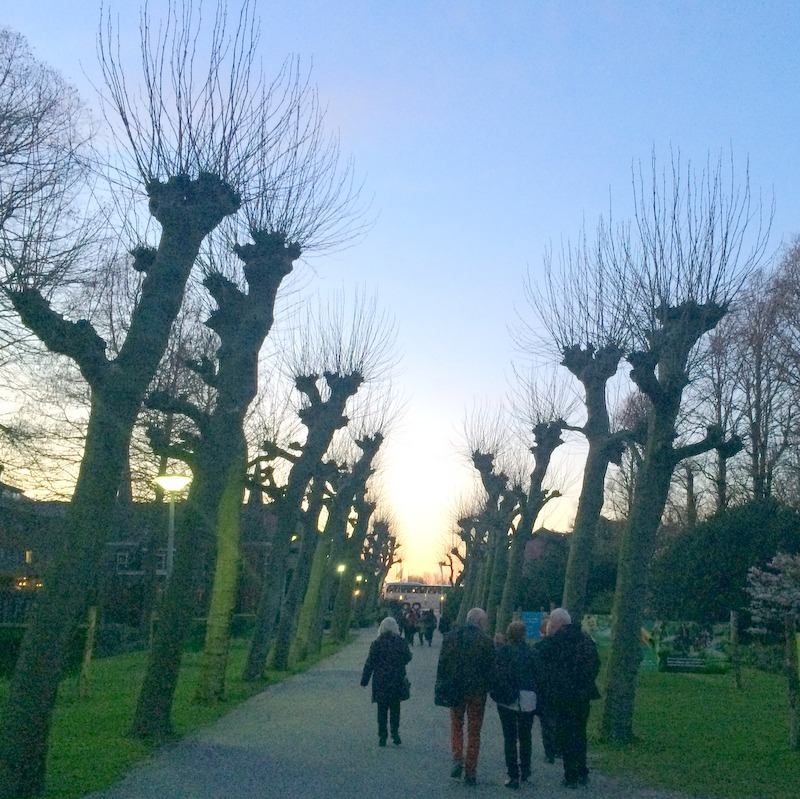 Explanations are given by a former mayor of Amsterdam. Very informative! 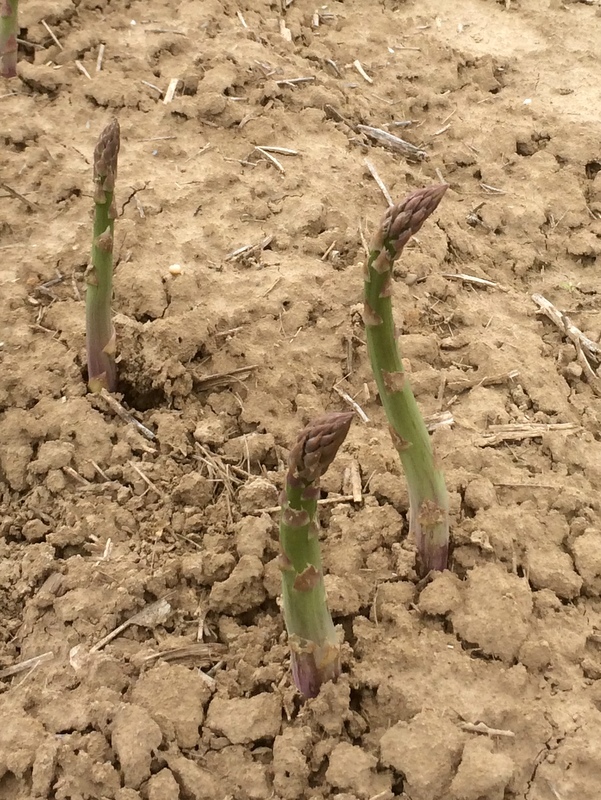 Two contrasting pictures to end this blog. 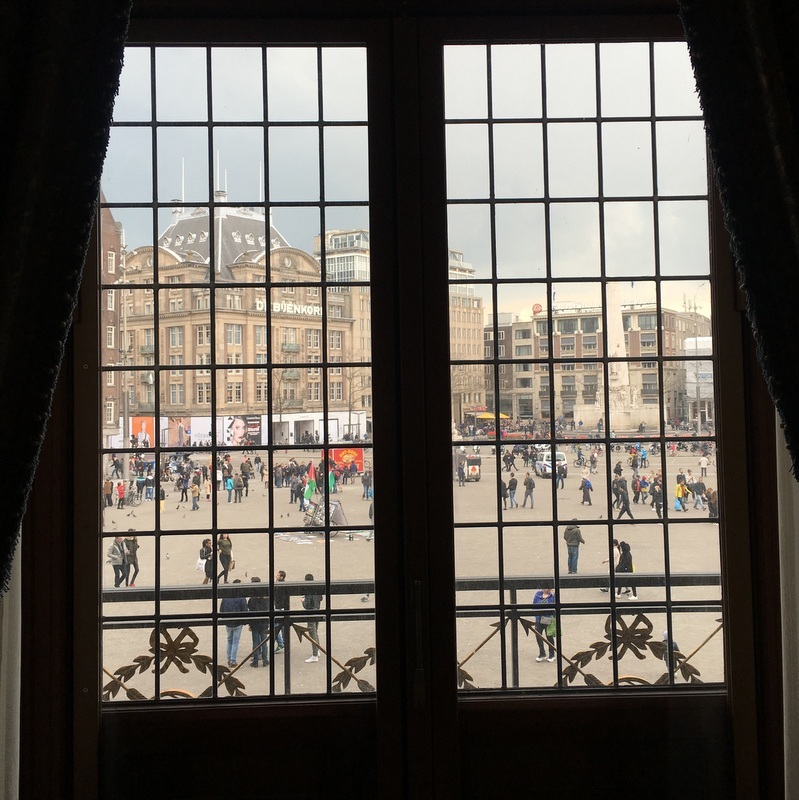 In the left picture you can see the Dam Square and the balcony, from which traditionally the new monarch is presented to the people. This balcony is not original, it has been added in 1808 by Louis Napoleon. The picture to the right is the only part of the ground floor that you can visit. It is the Tribunal, just below the room with the balcony, where death sentences were pronounced. After the verdict the criminal was taken up to the first floor, where a temporary scaffolding was constructed and the execution (by hanging) took place. 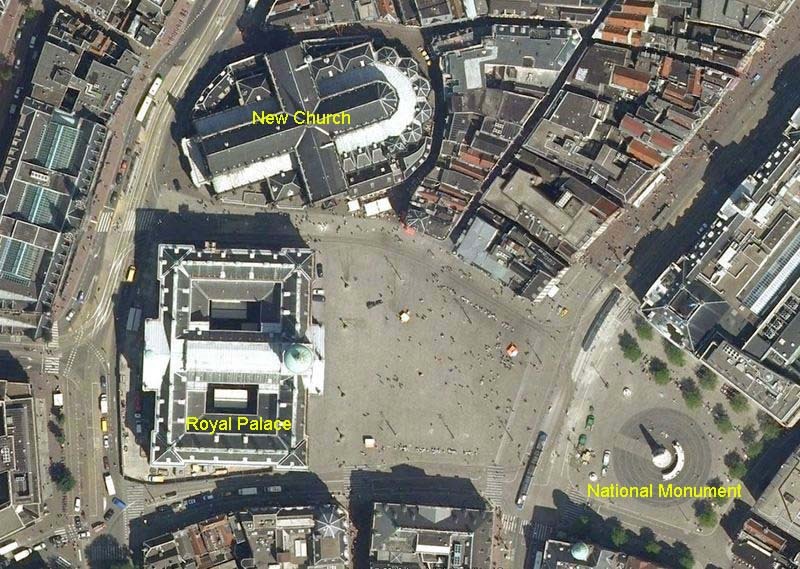 The executions were public, visible to the people on the Dam square. As readers of this blog will have noticed, I am a foodie and Malaysia is a paradise for foodies. But when I am back in my native country, I also enjoy the food there. In this blog you will find no nature, no culture, just food and more food.. 🙂 And me, of course I had my food often in company with family or friends, but in this blog you will only see food and me! A few times I also have invited friends for dinner at my apartment. But mostly I either go out with friends/family or have food at their place. One outside dinner deserves special mention. It has become a tradition that during my stay in Holland, I have a more or less “special” dinner with my lady friend Yolanda. 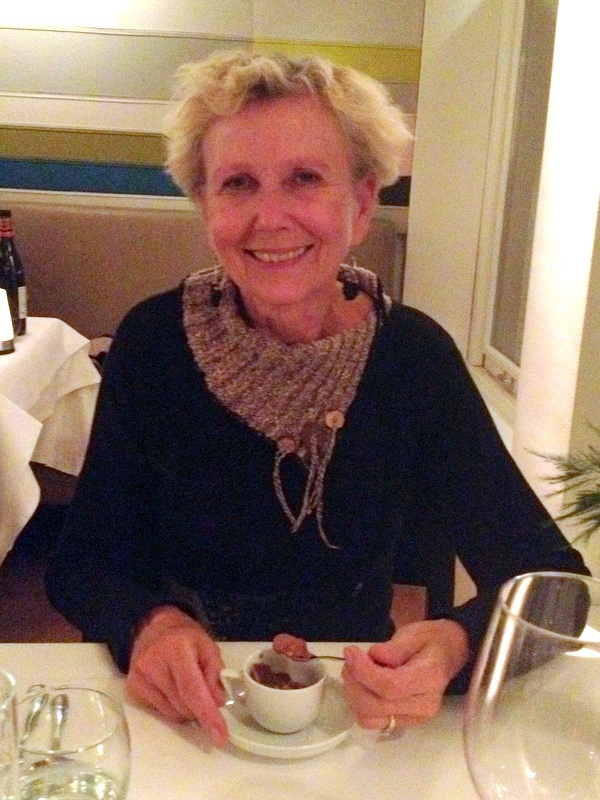 She knows about the fashionable restaurants..:-) This time we had dinner in restaurant Dwars. They specialize in serving beer(!) instead of wine with the various courses. It was a good choice, the food was delicious, the service very friendly, and it was value for money. 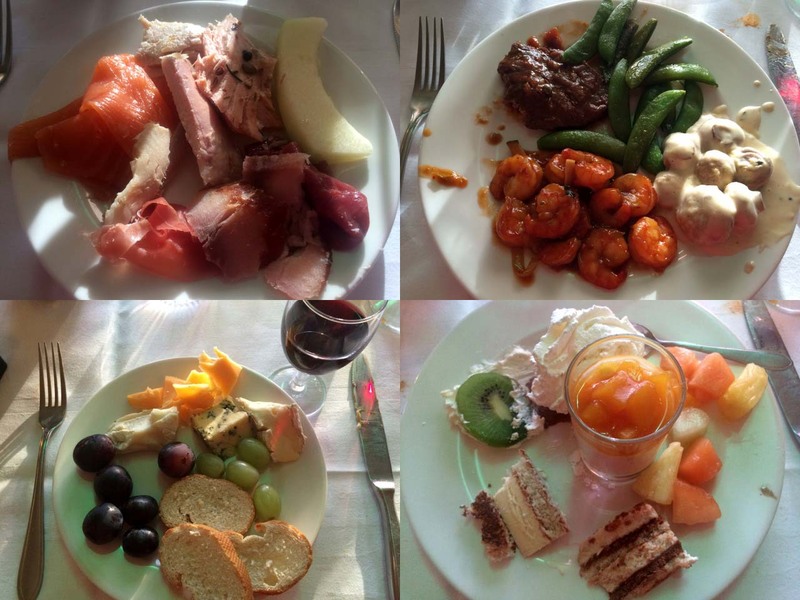 Here is a selection of food pictures with family and/or /friends. The House with the Cannon Ball is one of the few wooden houses in the town. During the Siege the Spanish army fired a cannon ball, which destroyed part of the house. The Fish Market dates back to the 16th century, the present fish tables were built in 1755. In many historical towns in the Netherlands you can still find so-called Hofjes , courtyards with almshouses. Financed and built by rich merchants for (generally) poor people. With rules and regulations. The Wildemanshofje has 24 houses and is only for ladies (even now) . 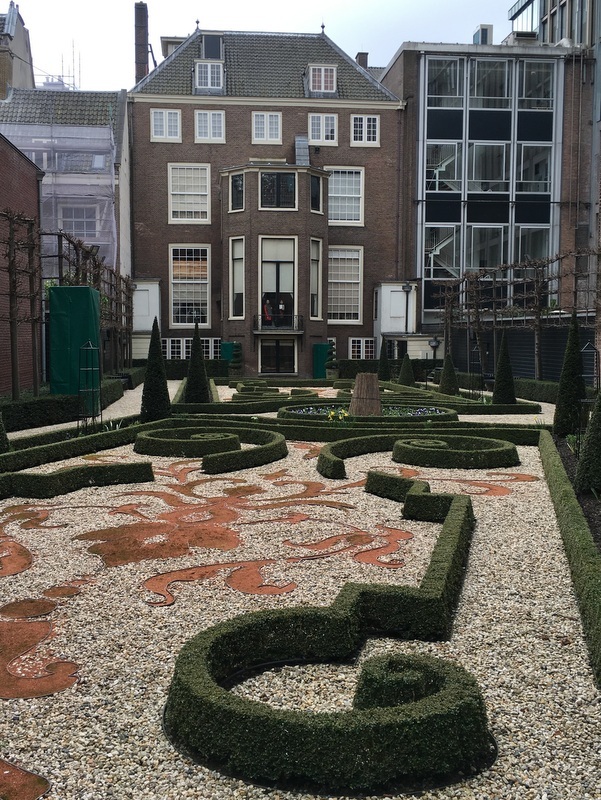 The Hofje van Splinter (1648) is a hidden gem, with only 8 (now 7) houses. 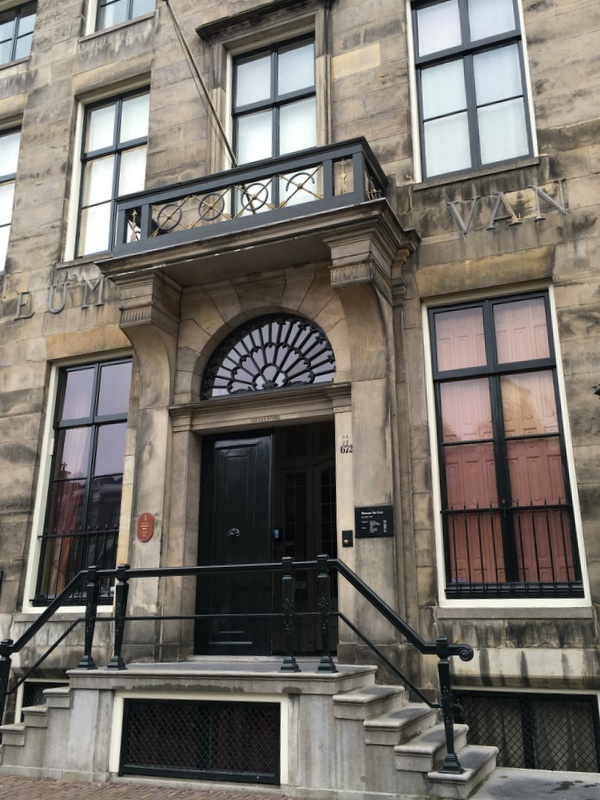 The Hof van Sonoy is bigger and is now a restaurant. I did not know that Alkmaar has many Jugendstil (Art Deco) houses. Next time I must find more, as it is one my favourite architectural styles. 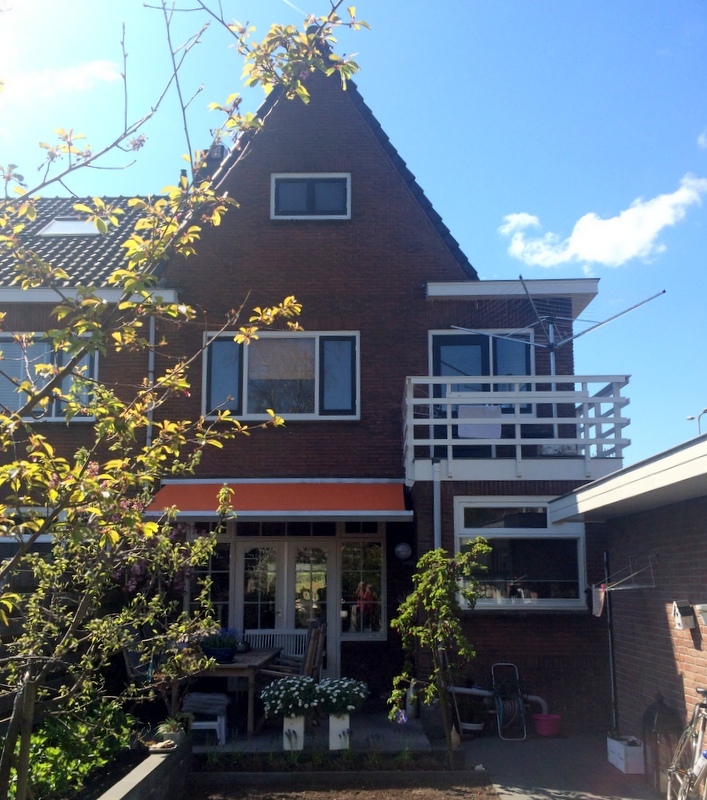 Arie and Ineke have a very nice house, on walking distance from the center. 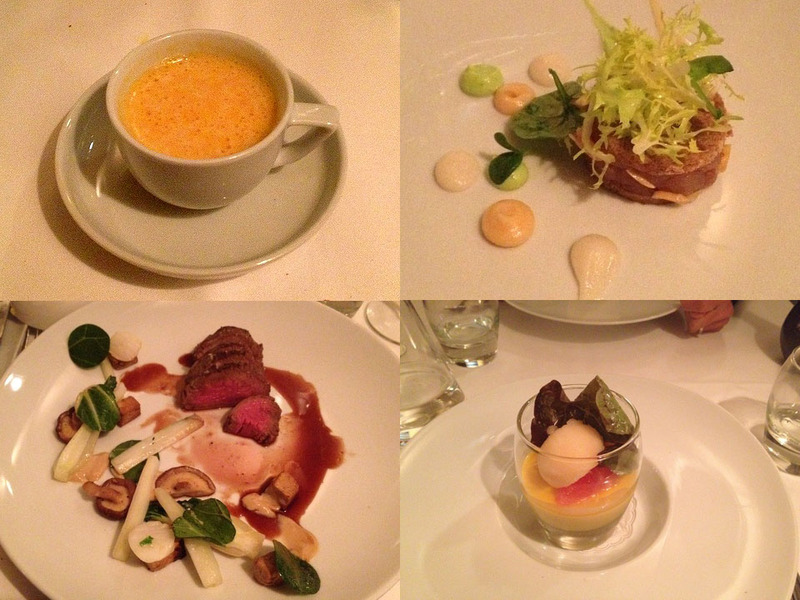 We had an enjoyable evening with very nice food. Middelburg is a town in the south-western part of the Netherlands and capital of the Zeeland province. It takes about 2.5 hour by train from Amsterdam, very remote according to Amsterdam standards…:-). So I have visited Middelburg (en Zeeland) a few times only. 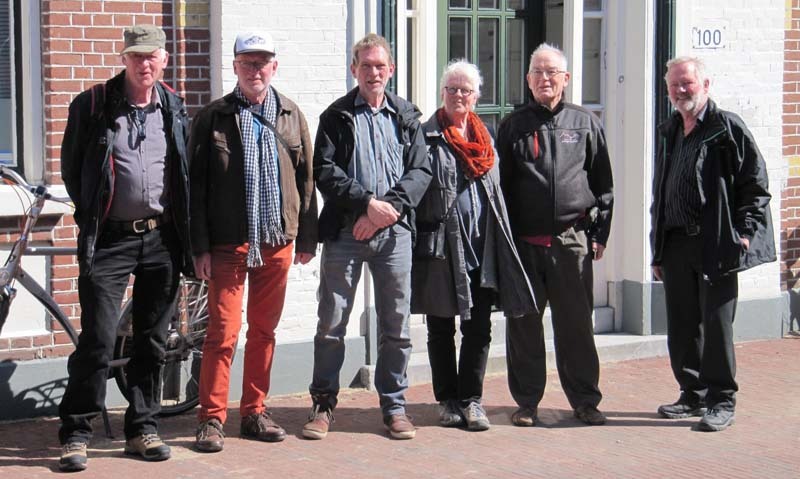 A friend of mine, Henk, is living in a small village near Middelburg, we know each other from our University days, more than 40 years ago! Since a few years we have a more or less regular contact again, because we are both interested in astronomy and cosmology. Finally this year we met for the first time in many decades. I could stay overnight in their “garden house”. Did I like mussels, Henk’s wife Nel asked me? Sure, I did and Zeeland is famous for its seafood. We continued our walk, admired the Town Hall and had coffee on a terrace at the Market square. I tried the Zeeland specialty, a cinnamon bun called bolus. Bolus means “turd” in English, quite an apt name, I think…:-) In May 1940 part of the historical center of Middelburg was destroyed by bombing and fire. I include one picture of the St Joris Doelen as it looked like in 1940. What a beautiful restoration. 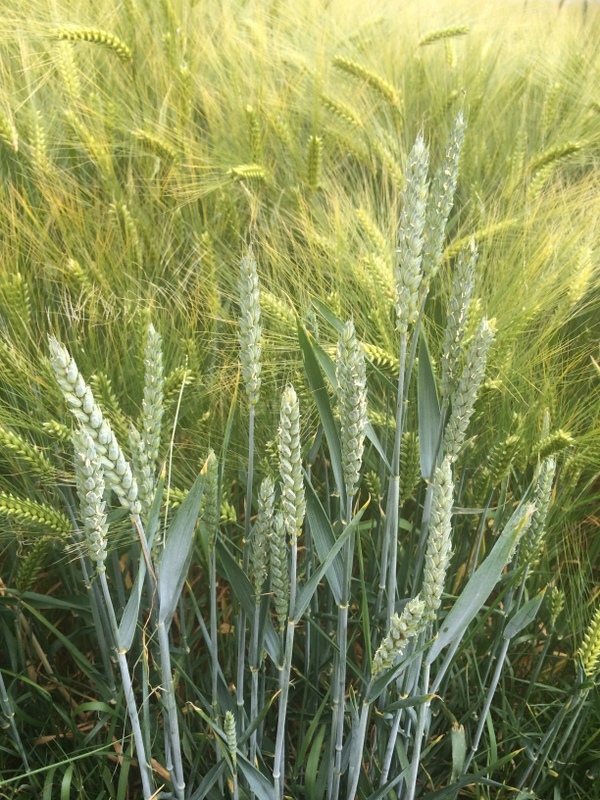 The same holds for the Abdij. After our lunch we had a look at the beautiful sundial of the Stadsschuur. Not everybody looking at this sundial will understand the meaning of the figure eight “decorations”. They are analemma’s. See the Equation of Time for technical details. From Middelburg it was only a short drive to Serooskerke where Henk and Nel are living in an attractive bungalow, with a beautiful garden. When they told me I could stay overnight in their “garden house”, I expected simple accommodation, so I was quite surprised that it was actually a full-fledged apartment. We had a very pleasant evening. Nel apologised that the mussel season was over, instead we had lobster. Yummy! And a dish with zeekraal (Salicornia, glasswort in English) and baked mussels. And ice cream with strawberries. What a treat. 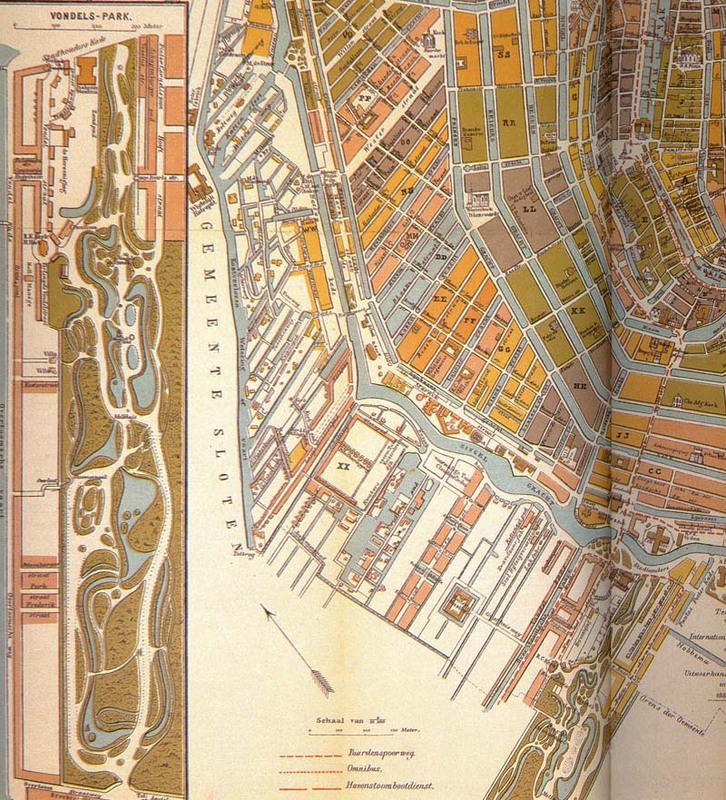 When I moved to Amsterdam in 1961, as a 17 year old freshman, I had lodgings near to the Vondelpark. Later, after I became a teacher, I have been living again close to this park, which can be considered the “Central Park” of Amsterdam..:-) Time for a homage. People walking their dog, joggers, roller skaters, bicyclists, sunbathers. Or just resting in the grass, enjoying another type of grass…LOL. At some places the smell of marijuana is so strong, that you almost can get high, just walking around. There are three more cafe’s in the park. In the Groot Melkhuis opened in 1874, you could drink fresh milk. Now it is a popular self-service cafe-restaurant with a playground for the kids.Here you can read what Tripadvisor says about it. 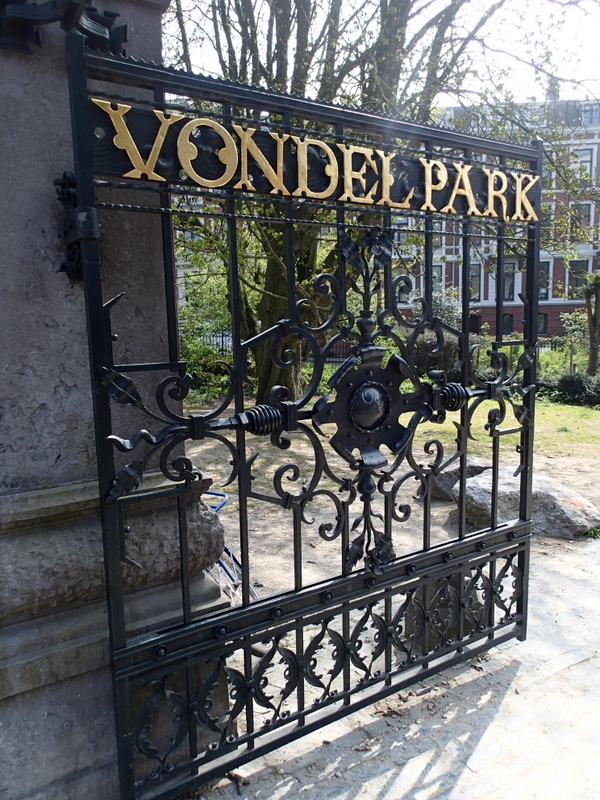 Originally the park was named the “Nieuwe Park” but later renamed Vondelpark after Holland’s most famous poet Joost van den Vondel. A statue of the poet was placed in the park in 1867. The bandstand was built in 1873. Several more sculptures can be found in the park and about each of them a story could be told. I will mention only the Mama Baranka sculpture, which was placed here in memory of Kerwin Duinmeyer, a 15 year old Antillean boy, who was killed by skinheads in 1983 because of his skin color. It was difficult to stop taking pictures on this sunny day in spring…:-) Nice cherry blossom, Egyptian geese with their chicks, a hot dog vendor, and everywhere people relaxing. 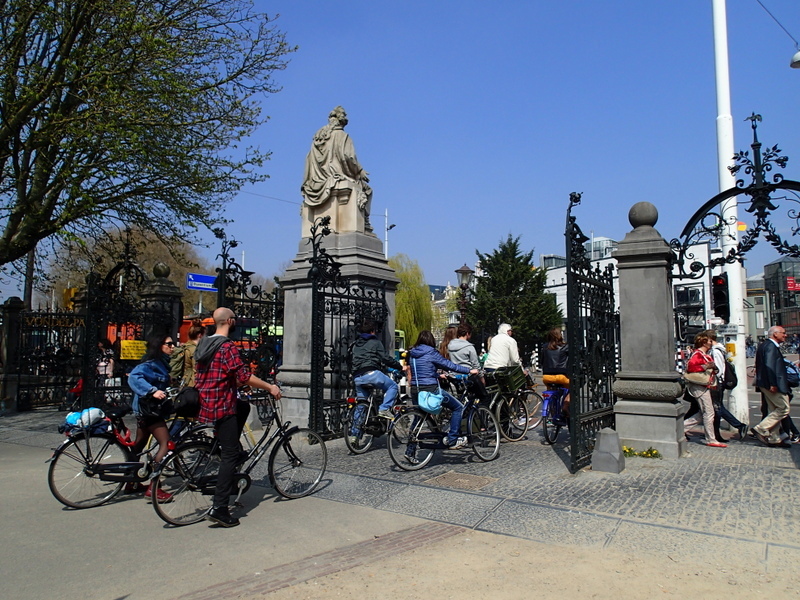 In the eastern section of the park, it is crossed by a bridge, the Vondelbrug. 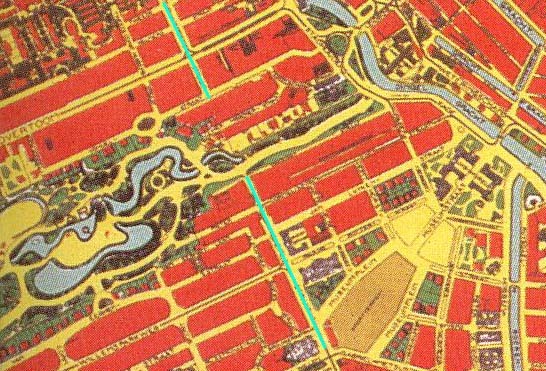 After the park was created, north and south of the park new neighborhoods came into being. 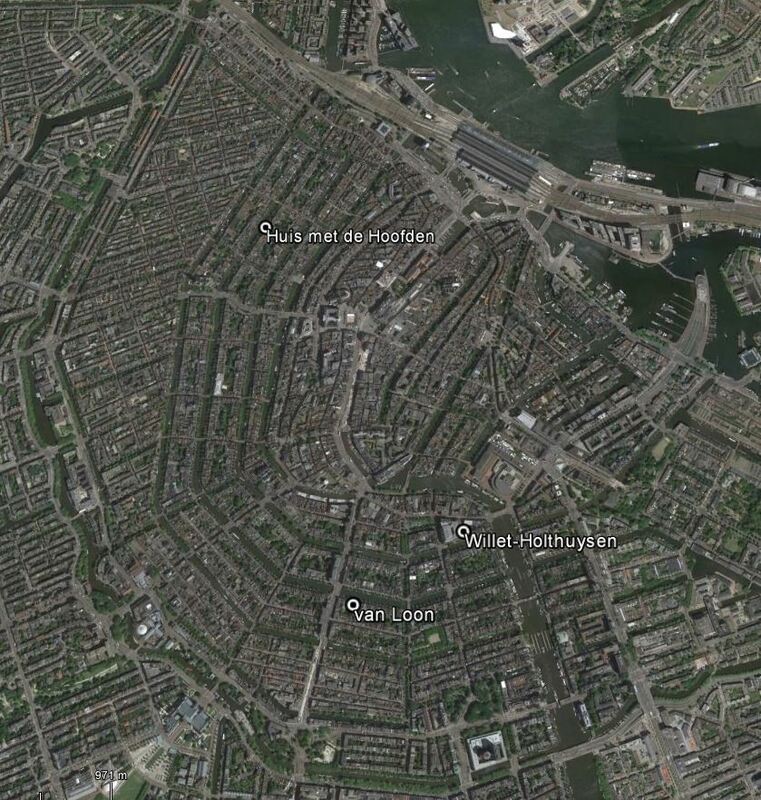 Divided by the Vondelpark! Here is the situation in 1905. City planners wanted of course a connection road “through” the park, connecting the two streets, indicated with a blue line. But for many years the association managing the park, resisted and it was only in 1947 that the connecting bridge was opened. Passing under the bridge we reach the eastern end of the park, with the main entrance, near the Leidseplein. 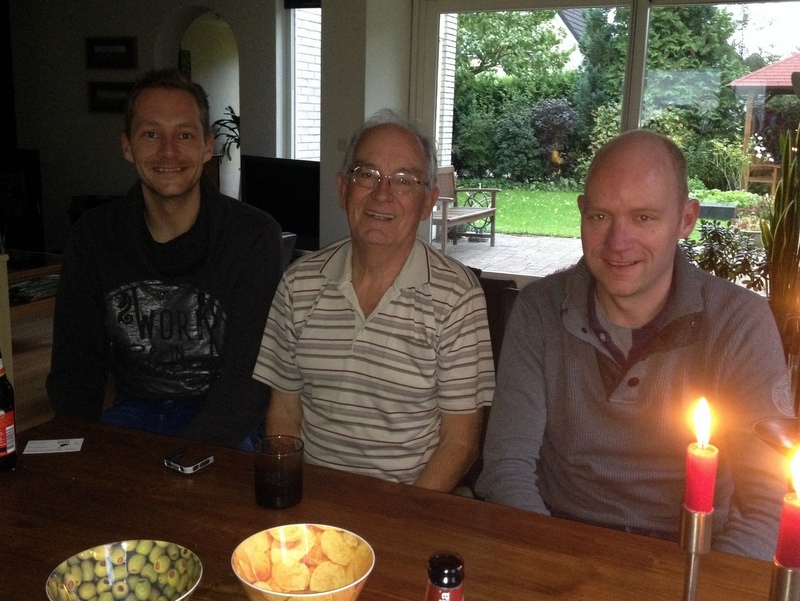 When I am back in the Netherlands, we always try to organise a family gathering. This time on 18 April, one day after my 71st birthday. First we met in the family house at the Conradstraat, where we grew up and where my youngest brother and his family are now living. It was a beautiful day, so we decided to take a walk through our hometown and see how much had changed..:-). Here are the six Stuivers, as we call ourselves. A stuiver was the popular name for a 5 cent coin, before the Euro was introduced. The buffet restaurant turned out to be a popular, crowded and quite noisy venue. A table had been reserved for us and we had a very friendly waitress. Starting wih a welcome cocktail, free flow of wine and beer, a large variety of food, even port with the cheese! Value for money. The problem with buffet restaurants is that my stomach is not big enough..:-( Here is what I managed to consume (hm, actually there was such a variety of starters that I had two plates). Before going home, we had a farewell drink in the family house. A very nice and satisfactory reunion! The last three weeks, after Aric went back to Malaysia, I have been busy with many social and cultural activities. 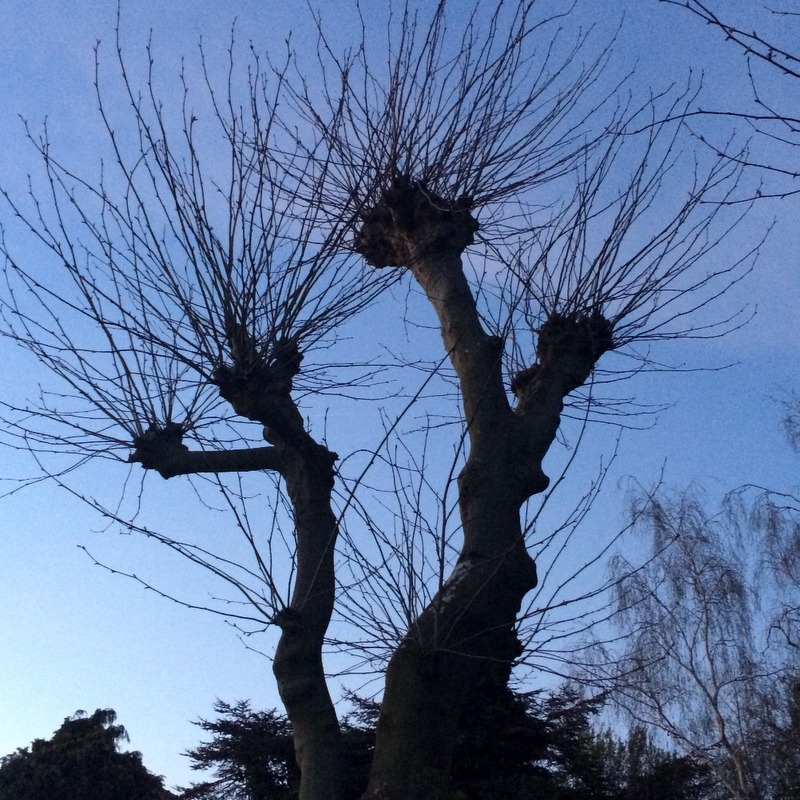 I started with visits to my GP, my cardiologist, my diabetician, my ophthalmologist and my dentist…. :-) Everything is under control. 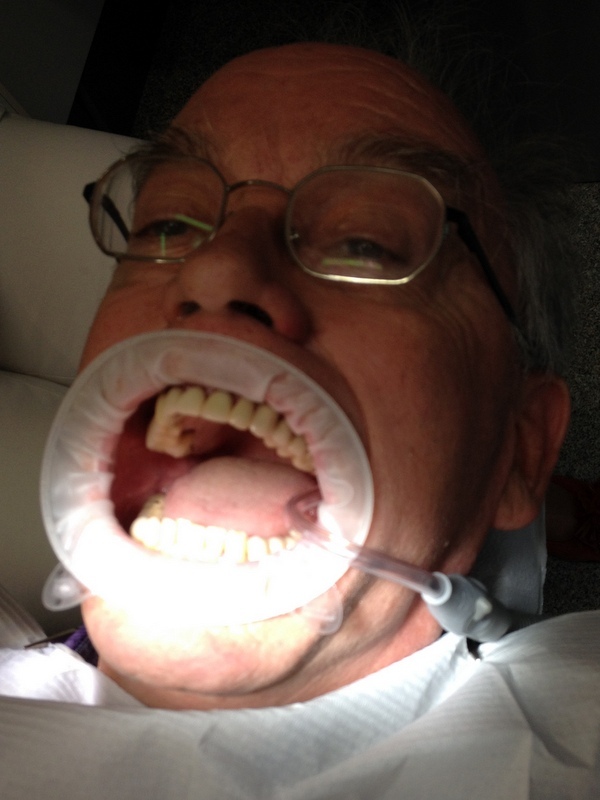 My dentist used a new torture contraption, which made me look like a breedbekkikker (wide-mouthed frog, rana ore lato, can only be found in the Netherlands, lol). I visited two more musea and went to two concerts. In the Concertgebouw I listened to Maria Pires, playing Beethoven. She got an ovational applause which she rightly deserved. With a friend I went to the Gauguin, Bonnard & Denis exhibition in the Amsterdam Hermitage museum. A bit disappointing, although the museum itself is worth a visit. 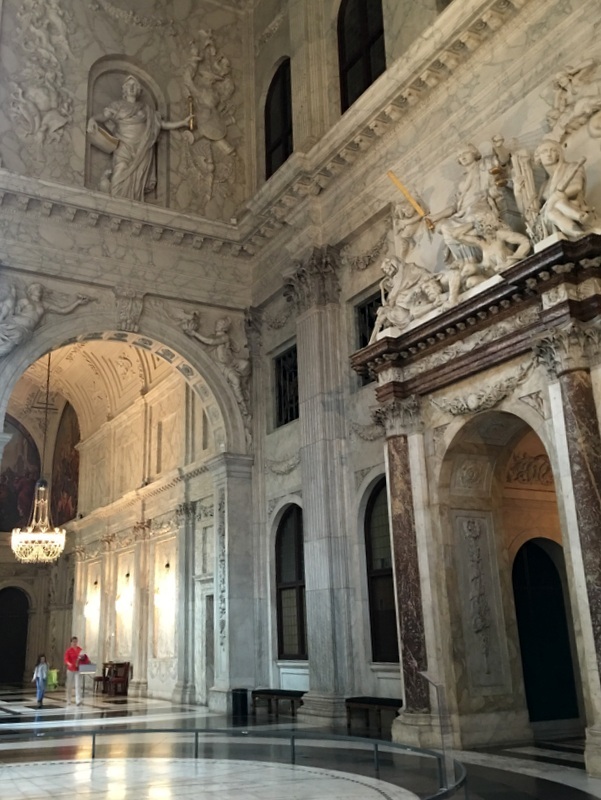 Another concert was given in the impressive Neo-Gothic Dominicus church in Amsterdam. My friend Yolanda sings in a choir, they performed works by Bach and Mozart. Beautiful music, especially the Bach cantata Aus der Tiefen rufe ich, Herr, zu dir . With another friend I went to an exhibition of Hundertwasser in the Cobra museum in Amstelveen. I have only one sister! Good luck with your new hip! 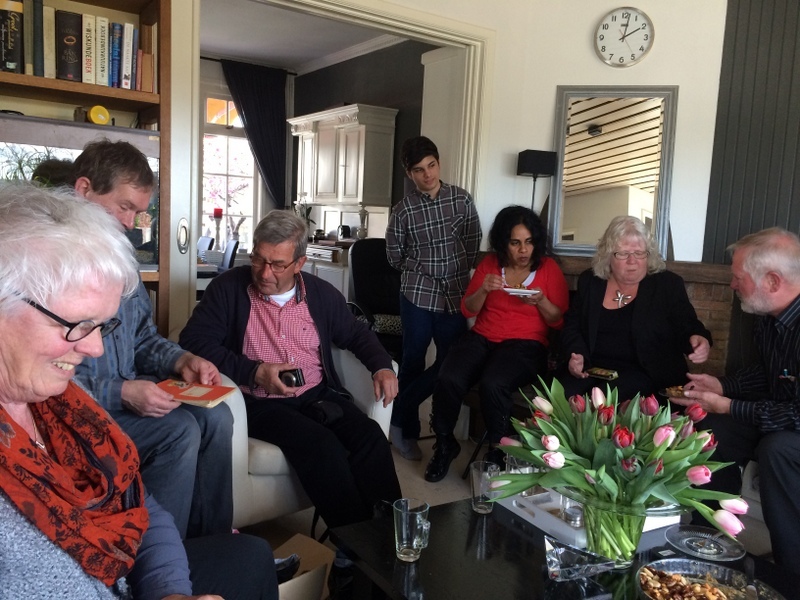 Just before coming back to Malaysia I went to Groningen to meet Ruud and his loved ones. 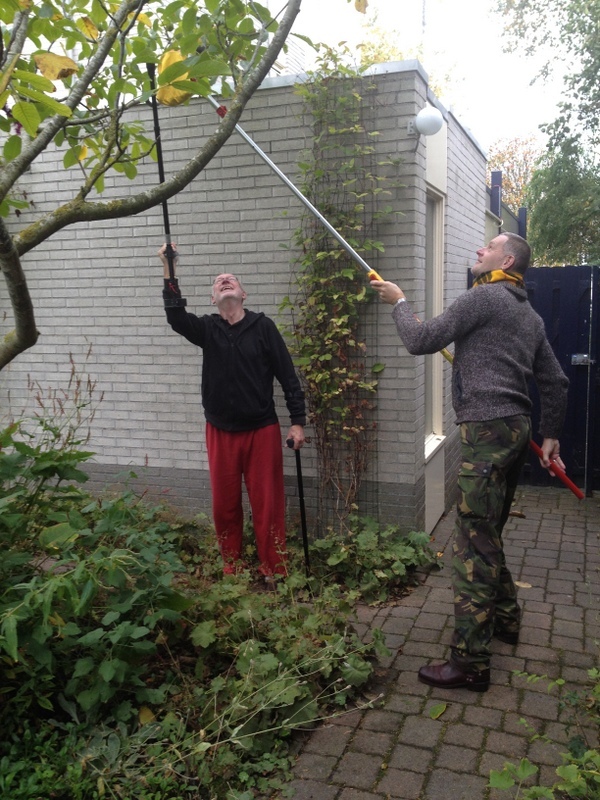 He was already able to walk in the garden with his crutches and could point out to Jur where the walnuts were hanging. I stayed overnight and met his two sons, my favourite nephews. I also met many friends, former students, ex-colleagues etc. Often for a drink and food, so not surprisingly I gained weight again, will have to work hard to slim down. The weather remained nice and warm with often spectacular sunsets. It was only during the last few days of my stay in the Netherlands that the weather became autumn-like, with some heavy rain and lower temperatures. But altogether I have been very fortunate, the weather gods must love me. 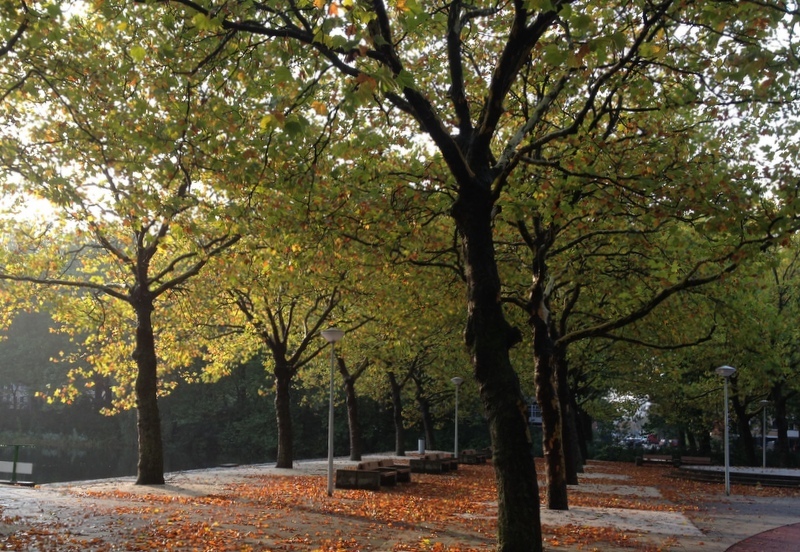 On my way to Schiphol airport I finally could take a picture of the trees near my apartment in autumn colors. I will end this post with a picture of my new watch. 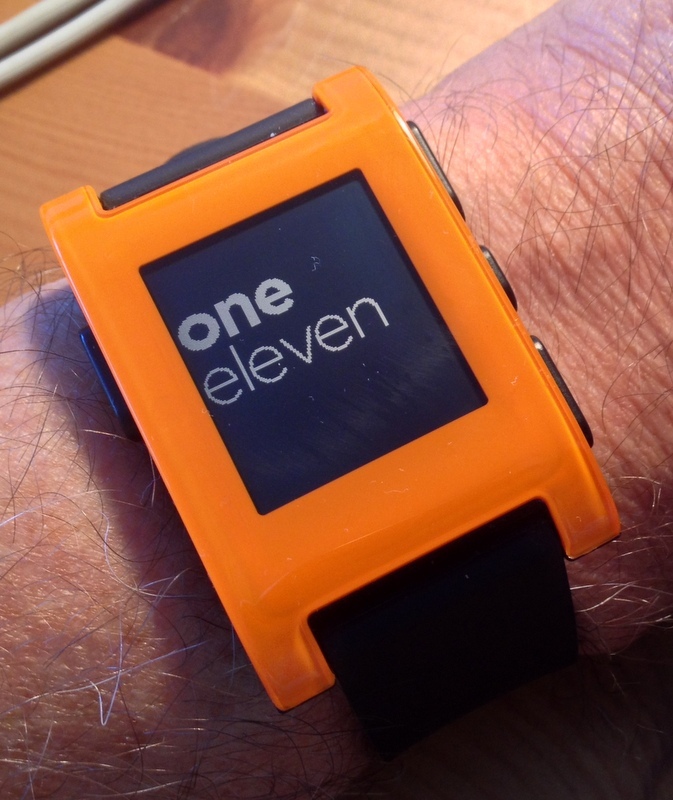 It is a Pebble watch, synchronised with my iPhone. It gives a warning when a SMS or email has arrived and you can choose between many different displays of the time.